"3LA1, V-1126" by Timothy K. Perttula and Robert Z. Selden Jr.
DECORATION: The lip has regular notching, and the upper rim panel has three horizontal engraved lines; there is a single row of tool punctates between two of the engraved lines. The bottom panel has a series of 10 concentric semi-circles (as seen on Avery Engraved, var. Bradshaw vessels at the Cedar Grove site, see Schambach and Miller 1984:119 and Figure 11-42a), only one of which has a hatched fill element. There is also a row of tool punctations at the vessel carination. The strap handles have rows of tool punctations around a central appliqued node. Avery Engraved, var. 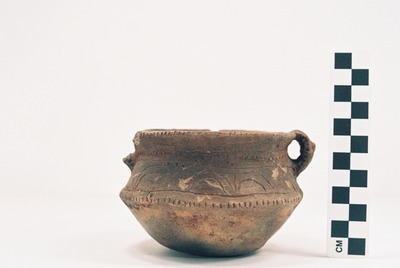 Bradshaw carinated bowl (5425-735).